Brass is a metal that looks good with wood, is easy to work, and can be soldered. You can use it for specific parts or create entire automaton with it! If you are going to use brass, probably the first thing you’ll want to do is cut some. It comes in all kinds of shapes and sizes. Let’s take a look at some of the more common formats and how to cut them. Remember to wear safety glasses when using any of these techniques. 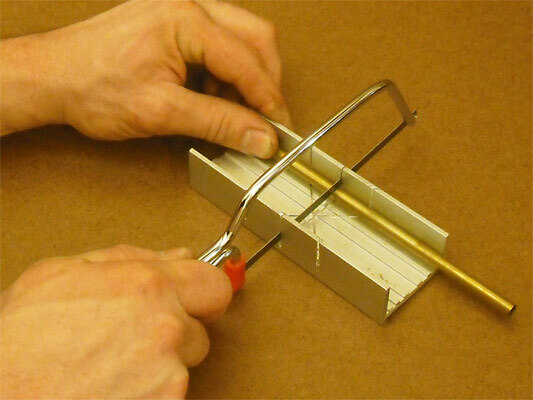 For smaller sizes of wire and rod, wire cutters will do the job. 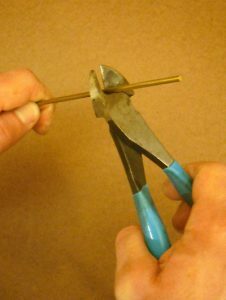 For larger gauges, you may need to use a larger pair of cutting pliers or bolt cutters for the really big stuff. With any of these tools, place the rod as far into the jaws as possible to make the cut. Some wire cutters leave the cut rod with a sharp, unsightly end. You will probably want to file, sand, or grind the end of the freshly cut rod so that it is flat. Place the rod to be cut in a sturdy vise. Try to make the cut as close to the vise as possible to minimize vibration. The hacksaw is a two-handed tool. Place one hand on the handle and your second hand on the end of the hacksaw frame. The saw cuts when you are pushing the tool away from your body. Start the cut with short strokes using the part of the blade nearest the handle. Once there is a groove for the blade to sit in, use both your arms and shifting body weight to make each cutting stroke. Not much downward pressure is needed, and then only when pushing the saw. A long, steady stroke that uses the full length of the blade is preferable to short, frantic stokes. Pay attention and slow down as you come close to cutting through the metal so the saw doesn’t cut something it’s not supposed to. You can use small and large metal saws to cut brass tubing. I’d recommend doing it in a small hobby mitre box or a groove you have cut into a piece of wood. Place the tubing in one of the mitre box grooves and begin the cut. As the saw makes its way through the tubing, it will begin to cut two walls at once. This can cause the saw to bind, making sawing difficult. To avoid this, slowly rotate the tubing away from you so that you are only sawing through one wall of the tubing at any given time. You can buy special cutters designed to cut metal tubing. The tool is clamped to the tubing and a circular blade progresses through the metal. Fasten the tool where the cut is to be made. Spin the tool around the tubing several times. Turn the knob a little to bring the blade against the tubing, and rotate again. Repeat this until the tubing has been divided. Don’t tighten the knob much or the tubing may end up with a crimped end. If this should happen, a tapered reamer can be used to spread opening. File the crimped end off or use a stationary belt sander to finish the edge. Cut the piece a little long to account for any amount that may need to be filed or sanded away. 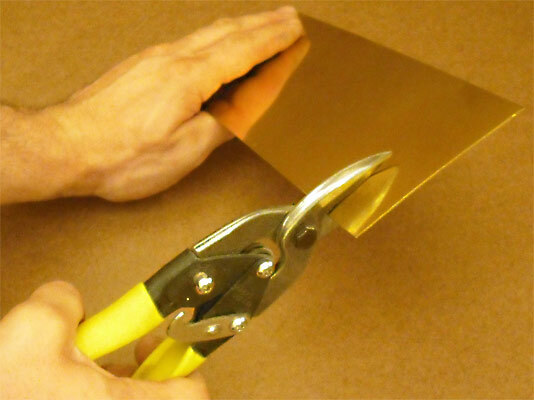 Brass sheet can be cut with metal shears and snips. The type I often use are called aviation snips. These come in three varieties: right-cutting, left-cutting, and straight-cutting. These usually have green, red, and yellow handles respectively. Despite the name, the straight-cutting variety can be used to cut curves — outside curves at least. When cutting a circle, trim the corners off the piece repeatedly until it starts to look like a circle made of straight cuts. Then, make the final curved cut using the inside of the jaws. If precision is required, it’s a good idea to cut outside of the desired line, then use a file to finish the job. Straight cuts in brass sheet can also be made with a hacksaw. 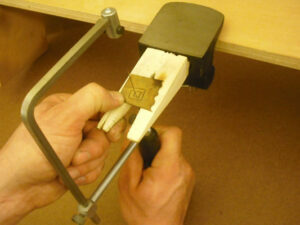 Place the brass between two sheets of scrap plywood and clamp all three pieces in a vise. The wood supports the metal during the cut. If you need to see a marked line on the surface of the brass, place a sheet of plywood on the back side of the brass only. Be mindful to only exert downward pressure when pushing the saw. With practice, a jeweler’s saw used in conjunction with a bench pin will allow you to cut very intricate shapes out of brass sheet. The V-shaped notch in the bench pin is used to support the metal on both sides of the blade. The saw is held vertically, with the handle on the bottom and the saw teeth facing away from you. You basically look down on the saw as you make a cut. Here are a few rules of thumb I’ve found helpful. First, make sure the blade is taught in the saw frame and the slant of the saw teeth point down toward the handle. Rub beeswax or a commercial lubricant such as ‘Cut Lube’ on the back of the saw blade. With the metal resting flat on the bench pin, start the cut with the saw at a 45 degree angle, the top of the saw frame pointing away from you. Once a groove for the blade has been established, bring the saw upright so that it is perpendicular to the material being cut. Use long, slow, rhythmic strokes and don’t force the saw. When cutting curves, turn and guide the metal into the blade. Never place a finger in front the blade — even if it is some distance away. These thin blades break often. 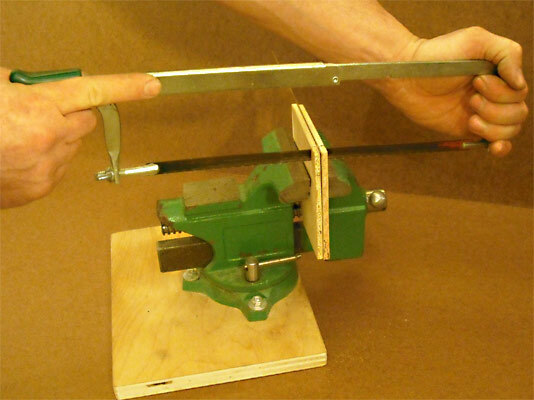 A handy motorized rotary tool can also cut brass rod, tubing, and sheets. 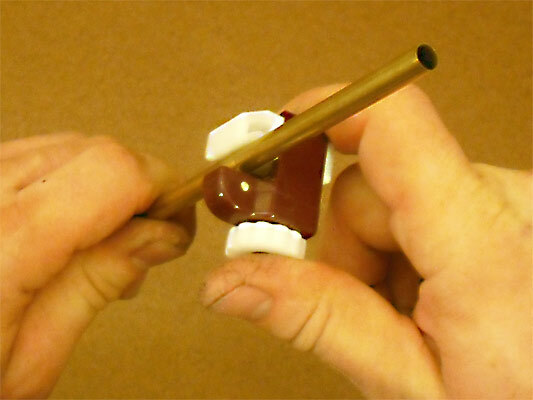 See Tips article number 6, 21 Rotary Tool Tips and Tricks for Automaton-Makers, for details on how to use this tool to cut metals. 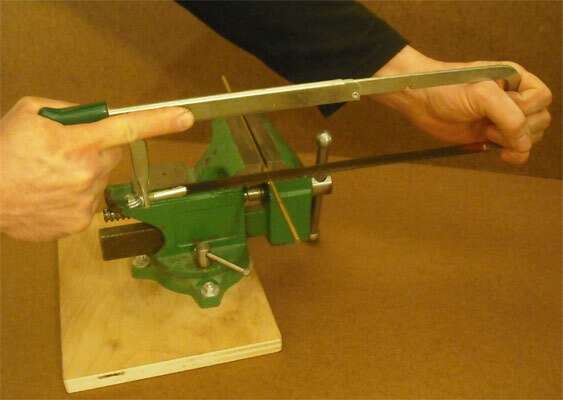 Be sure to clamp the rod in a vise, put on heavy gloves, and wear eye protection. 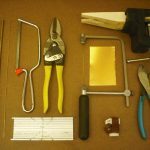 This article only covers some of the many ways to cut brass. There are more techniques to discover used in a variety of trades and crafts! I hope you’ll find and share them. Warning: The topics covered in this column include the use of tools and materials that have the potential to cause damage to property and/or bodily injury. Your safety is important and it is your sole responsibility. Always read and follow the safety instructions that come with tools and materials you use. Wear safety glasses, use guards and other forms of safety equipment, follow safety precautions, and use good judgment. Seek the guidance of experienced outside sources whenever required. Thanks for this, I have an almost unhealthy obsession with brass! Could you offer any advice on soldering to brass and what materials to use to do this? Whenever I’ve tried the solder never seems to stick. Look forward to your next blog! Brass is generally pretty easy to solder. Here’s the key: preparation. You want to make sure your pieces fit together as closely as possible. The solder should only form the thinnest of films to join the two pieces. It shouldn’t really be used to fill big voids. Make sure the pieces are also very clean. Use abrasive papers to make them bright, then clean them with alcohol. Add flux, then heat the metal (not the solder). Test the temp with a piece of solder until it flows. Use the heat to draw the solder through the joint (it moves toward the highest heat). I have had good luck with Tix brand solder and flux. I appreciate all of the demonstrations of how to cut different types of brass. Like you explain there are a lot of different types of brass, so there are also a lot of different instruments that you need to cut it with. I think that before starting a project it would be a good idea to make sure that you have all of the necessary tools. Once you know you have all of the tools that you will need it will be much easier to get the job done. Agreed! 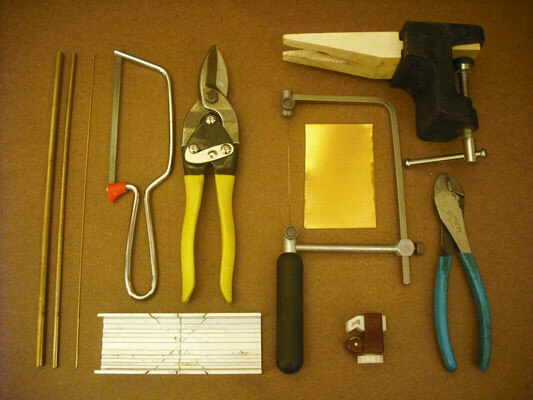 We try to include a photo in each article showing the tools and materials used. It’s interesting to know that when it comes to cutting brass that there are different ways to go about doing it, and each one will have it’s benefits to it. I am glad you pointed out that when it comes to sawing the tubing that slowly rotating the tube to help only cut through one wall at a time. This will be helpful when it comes to the different crafts that I use brass for. i have a 3mm thick brass plate. its 51mm wide. i cant cut perfect mitres by hand. So judging by your info above, it can be cut with a dropsaw? Thanks so much for explaining these different methods so thoroughly. I also love brass as other Arya does. I am learning to metalsmith and brass is so affordable compared to silver, and especially gold. I find a lot of people, especially in the jewelry community are snobby about brass because it tarnishes. I love the look of different patinas that you can get on brass and copper. Additionally, some of my favorite contemporary metalsmiths use brass and I love the kind of ancient, yet modern looks they achieve. Your tips about using a mitre box or groove in wood are very helpful as well as explaining how to use a tube cutter. I have a mini tube cutter, but I haven’t spent much time using it and found it challenging. I want to make some tube beads and I am more confident to give it a shot. I need to practice working more with my jewelers saw. I have to admit that that is the biggest thing that I struggle with and I break a lot of blades. I tend to be impatient so I would much rather cut with shears and clean the edges up with a file or grinder. I had no idea that there were different shears for cutting in different directions, but that totally makes sense. My biggest struggle with using shears is cutting an angle cut into it without overcutting into the piece. An example is this morning I was cutting out some feather shaped pendants and I was trying to make little notches like real feathers have, It kept getting smaller and smaller as I cut too far. Do you have any suggestions?